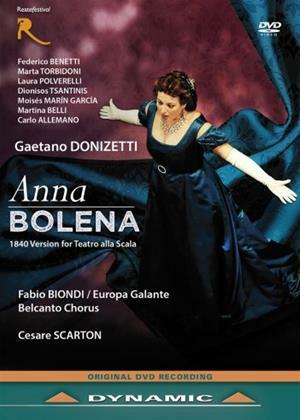 This production of Anna Bolena faithfully meets the musical vision proposed by Fabio Biondi. The mise-en-scène, therefore, excludes any explicit reference to the plot's historical time, and the events have been set at the beginning of the 1800s, when Donizetti's opera was premièred. This shift in time was meant to match, visually, the important musical reconstruction made by Fabio Biondi: just as he tapered down the orchestral forces to 19th-century proportions and conformed to the performing practice of the day using, for example, the fortepiano as a concertante instrument, which created surprisingly new sound effects compared to traditional versions, often still too linked to the late-romantic symphonic model we have transformed the world of Anne Boleyn and Henry VIII into a metaphor of 19th-century society, in which an unhappy woman, an ill-fated, condemned and spurned woman earns the crown of martyrdom and the halo of sainthood.